Tenente, I. M., Tang, Q., Moore, J. C., Langenau, D. M. Normal and Malignant Muscle Cell Transplantation into Immune Compromised Adult Zebrafish. J. Vis. Exp. (94), e52597, doi:10.3791/52597 (2014). Tris-EDTA buffer solution 1x Sigma-Aldrich 93283-100ML Microinjection. Injection mix. Potassium Chloride Fisher Science Education S77375-1 Microinjection. Injection mix. XhoI Restriction Enzyme New England Biolabs R0146S Microinjection. Plasmid linearization. QIAquick PCR Purification Kit Qiagen 28104 (50) or 28106 (250) Microinjection. For purification of linearized plasmid up to 10 kb. Phenol/Chloroform/Isoamyl Alcohol Fisher Scientific BP1753I-100 Microinjection. For purification of linearized plasmid. UltraPure Agarose, 500 g Invitrogen 16500-500 Microinjection. Linearized plasmid quantification. Nanodrop 2000 Spectrophotometer Thermo Scientific http://www.nanodrop.com/Productnd2000overview.aspx Microinjection. Linearized plasmid quantification. Tricaine methanesulphonate (MS-222) Western Chemical Inc. http://www.wchemical.com/tricaine-s-ms-222.html Transplantation. Anesthetic. Caution: Irritant. Irritating to eyes, respiratory system, and skin. VWR Absorbent Bench Underpads VWR 56616-018 Transplantation. Regular paper towels or sponge can be used as an alternative. Austin's A-1 Bleach, Commercial James Austin Company Transplantation. Any commercial solution can be used. Ethanol 190 Proof Decon Labs, Inc. DSP-MD.43 Microinjection (linearized plasmid purification) and transplantation. Any commercial solution can be used. Sorvall Legend XFR Centrifuge Thermo Scientific 75004539 Transplantation. Catalog number for 120 V, 60 Hz (US). Corning Stripettor Plus Pipetting Controller Corning Incorporated 4090 Transplantation. Any automatic pipetting controller can be used. Powder free examination gloves All steps. Any commercial brand can be used. Filter pipet tips and micropipettes All steps. Any commercial brand can be used. Fluorescent Stereomicroscope Olympus MVX10 Scoring. Any appropriate fluorescent stereomicroscope can be used. Olympus DP72 microscope digital camera Olympus DP72 Scoring. Multiple adequate cameras for the selected imaging system can be used. Gemberling, M., Bailey, T. J., Hyde, D. R., Poss, K. D. The zebrafish as a model for complex tissue regeneration. Trends in genetics TIG. 29, (11), (2013). Boatman, S., Barrett, F., Satishchandran, S., Jing, L., Shestopalov, I., Zon, L. I. Assaying hematopoiesis using zebrafish. Blood cells, molecule., & diseases. 51, (4), 271-276 (2013). Langenau, D. M., Traver, D., et al. Myc-induced T cell leukemia in transgenic zebrafish. Science. 299, (5608), 887-890 (2003). Yang, H. W., Kutok, J. L., et al. Targeted Expression of Human MYCN Selectively Causes Pancreatic Neuroendocrine Tumors in Transgenic Zebrafish Targeted Expression of Human MYCN Selectively Causes Pancreatic Neuroendocrine Tumors in Transgenic Zebrafish. Cancer Research. 7256-7262 (2004). Patton, E. E., Widlund, H. R., et al. BRAF mutations are sufficient to promote nevi formation and cooperate with p53 in the genesis of melanoma. Current Biology. 15, (3), 249-254 (2005). Sabaawy, H. E., Azuma, M., Embree, L. J., Tsai, H. -J., Starost, M. F., Hickstein, D. D. TEL-AML1 transgenic zebrafish model of precursor B cell acute lymphoblastic leukemia. Proceedings of the National Academy of Sciences of the United States of America. 103, (41), 15166-15171 (2006). Langenau, D. M., Keefe, M. D., et al. Effects of RAS on the genesis of embryonal rhabdomyosarcoma. Gene. 21, (11), 1382-1395 (2007). Le, X., Langenau, D. M., Keefe, M. D., Kutok, J. L., Neuberg, D. S., Zon, L. I. Heat shock-inducible Cre/Lox approaches to induce diverse types of tumors and hyperplasia in transgenic zebrafish. Proceedings of the National Academy of Sciences of the United States of America. 104, (22), 9410-9415 (2007). Park, S. W., Davison, J. M., Rhee, J., Hruban, R. H., Maitra, A., Leach, S. D. Oncogenic KRAS induces progenitor cell expansion and malignant transformation in zebrafish exocrine pancreas. Gastroenterology. 134, (7), 2080-2090 (2008). Zhuravleva, J., Paggetti, J., et al. MOZ/TIF2-induced acute myeloid leukaemia in transgenic fish. British journal of haematology. 143, (3), 378-382 (2008). Ignatius, M. S., Chen, E. Y., et al. In vivo imaging of tumor-propagating cells, regional tumor heterogeneity, and dynamic cell movements in embryonal rhabdomyosarcoma. Suppl Data. Cancer cell. 21, (5), 680-693 (2012). Blackburn, J. S., Liu, S., et al. Clonal Evolution Enhances Leukemia-Propagating Cell Frequency. Cancer cell. 25, (3), 366-378 (2014). Blackburn, J. S., Langenau, D. M. Zebrafish as a model to assess cancer heterogeneity, progression and relapse. Disease model. 7, (7), 755-762 (2014). 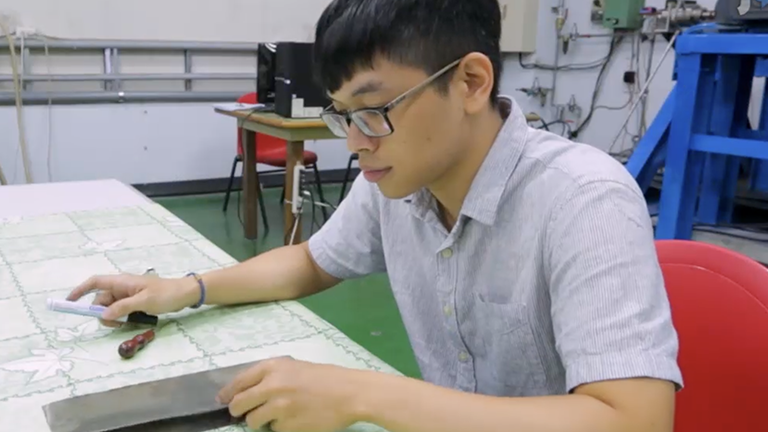 Zhao, C., Wang, X., et al. A novel xenograft model in zebrafish for high-resolution investigating dynamics of neovascularization in tumors. PloS one. 6, (7), e21768 (2011). Chen, E. Y., DeRan, M. T., et al. Glycogen synthase kinase 3 inhibitors induce the canonical WNT/β-catenin pathway to suppress growth and self-renewal in embryonal rhabdomyosarcoma. Proceedings of the National Academy of Sciences of the United States of America. 111, (14), 5349-5354 (2014). Yang, X. -J., Cui, W., et al. 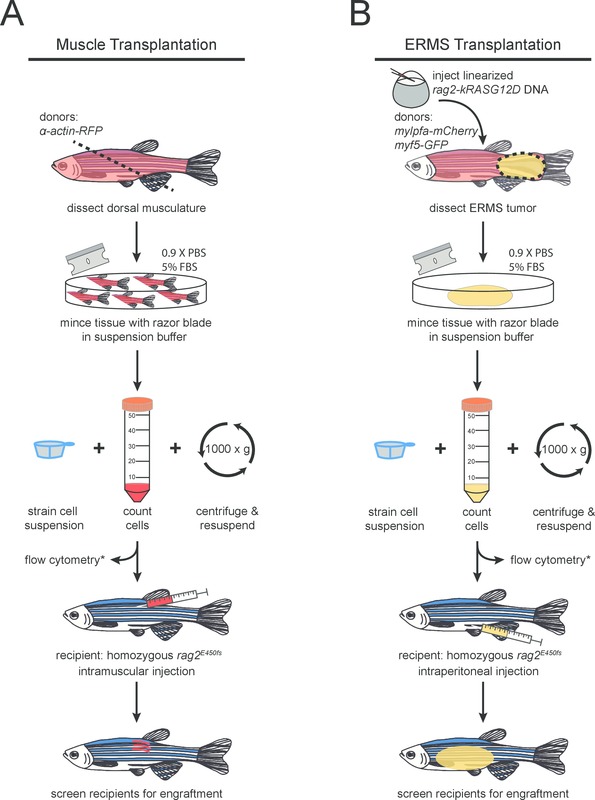 A novel zebrafish xenotransplantation model for study of glioma stem cell invasion. PloS one. 8, (4), e61801 (2013). Chapman, A., Fernandez del Ama, L., Ferguson, J., Kamarashev, J., Wellbrock, C., Hurlstone, A. Heterogeneous Tumor Subpopulations Cooperate to Drive Invasion. Cell Reports. 8, (8), 1-8 (2014). Smith, A. C. H., Raimondi, A. R., et al. High-throughput cell transplantation establishes that tumor-initiating cells are abundant in zebrafish T-cell acute lymphoblastic leukemia. Blood. 115, (16), 3296-3303 (2010). Iyengar, S., Houvras, Y., Ceol, C. J. Screening for melanoma modifiers using a zebrafish autochthonous tumor model. Journal of visualized experiments JoVE. (69), e50086 (2012). Mizgireuv, I., Revskoy, S. Y. Transplantable tumor lines generated in clonal zebrafish. Cancer research. 66, (6), 3120-3125 (2006). Streisinger, G., Walker, C., Dower, N., Knauber, D., Singer, F. Production of clones of homozygous diploid zebra fish (Brachydanio rerio). Nature. 291, 293-296 (1981). 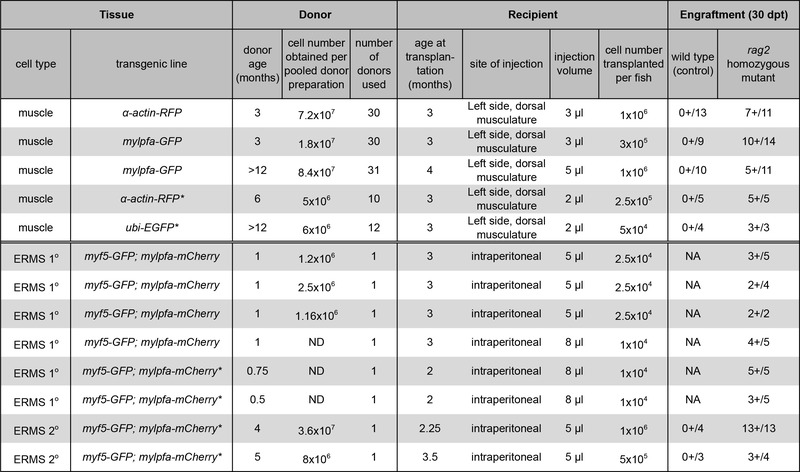 Blackburn, J. S., Liu, S., Langenau, D. M. Quantifying the frequency of tumor-propagating cells using limiting dilution cell transplantation in syngeneic zebrafish. Journal of visualized experiments JoVE. (53), e2790 (2011). Tang, Q., Abdelfattah, N. S., et al. Optimized cell transplantation using adult rag2 mutant zebrafish. Nature methods. 11, 821-824 (2014). Zhou, Q., Facciponte, J., Jin, M., Shen, Q., Lin, Q. Humanized NOD-SCID IL2rg–/– mice as a preclinical model for cancer research and its potential use for individualized cancer therapies. Cancer letters. 344, (1), 13-19 (2014). 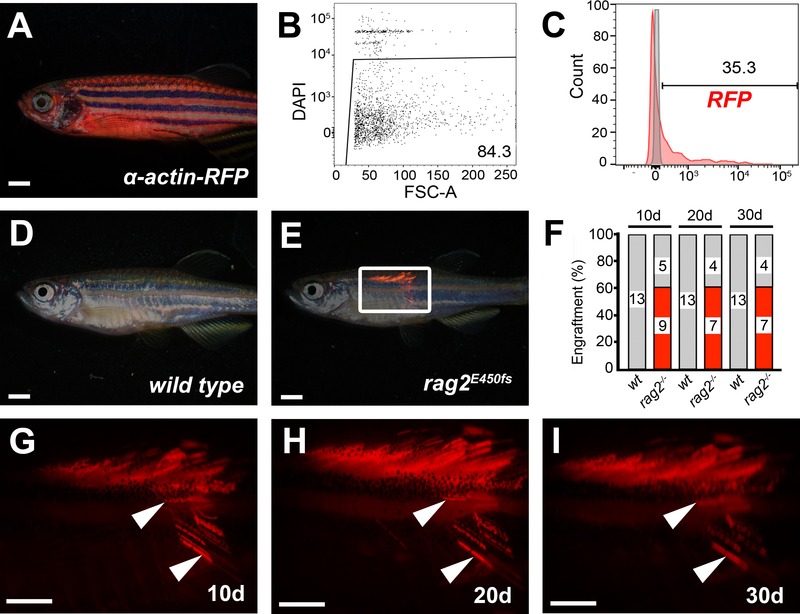 Higashijima, S., Okamoto, H., Ueno, N., Hotta, Y., Eguchi, G. High-frequency generation of transgenic zebrafish which reliably express GFP in whole muscles or the whole body by using promoters of zebrafish origin. Developmental biology. 192, (2), 289-299 (1997). Langenau, D. M., Keefe, M. D. D. D., et al. Co-injection strategies to modify radiation sensitivity and tumor initiation in transgenic Zebrafish. Oncogene. 27, (30), 4242-4248 (2008). Rosen, J. N., Sweeney, M. F., Mably, J. D. Microinjection of zebrafish embryos to analyze gene function. J Vis Exp. (25), 1-5 (2009). Westerfield, M. The zebrafish book. A guide for the laboratory use of zebrafish (Danio rerio). University of Oregon PRess. Eugene, OR. (2000). Alexander, M. S., Kawahara, G., et al. Isolation and transcriptome analysis of adult zebrafish cells enriched for skeletal muscle progenitors). Muscl, & nerve. 43, (5), 741-750 (2011). Motohashi, N., Asakura, Y., Asakura, A. Isolation, culture, and transplantation of muscle satellite cells. Journal of visualized experiments JoVE. (86), 1-7 (2014). Gerli, M. F. M., Maffioletti, S. M., Millet, Q., Tedesco, F. S. Transplantation of induced pluripotent stem cell-derived mesoangioblast-like myogenic progenitors in mouse models of muscle regeneration. J Vis Exp. (83), e50532 (2014). Siegel, A. L., Gurevich, D. B., Currie, P. D. A myogenic precursor cell that could contribute to regeneration in zebrafish and its similarity to the satellite cell. The FEBS journal. 280, (17), 4074-4088 (2013). Rowlerson, a, Radaelli, G., Mascarello, F., Veggetti, Regeneration of skeletal muscle in two teleost fish: Sparus aurata and Brachydanio rerio. Cell Tissue Res. 289, (2), 311-322 (1997). White, R. M., Sessa, A., et al. Transparent adult zebrafish as a tool for in vivo transplantation analysis. Cell stem cell. 2, (2), 183-189 (2008).